This taco filling is flat out delicious. You will love it. It may sound difficult but it is really not that time consuming. You can make a double batch as it freezes really well. 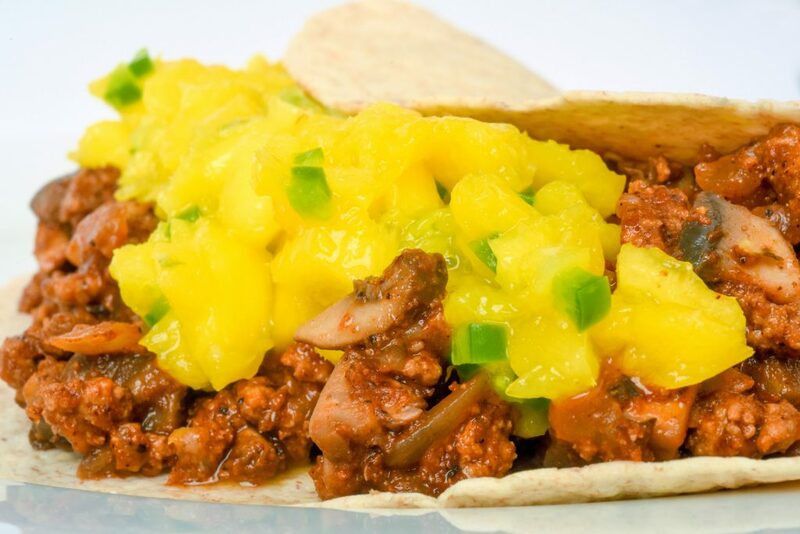 Serve on corn tortillas with shredded cabbage, lime wedges, and our Ginger Mango Salsa. Chop the mushrooms finely. This can be done in a food processor. Cook the chopped mushrooms in a hot skillet over medium-high heat until well done and no moisture remains, approximately 5-7 minutes. Remove the mushrooms from the pan and set aside. Heat the oil in the skillet and add the onions. Cook for 1-2 minutes stirring frequently. Add the taco seasoning and the tomato paste. Stir to combine. Add the cooked mushrooms and the cooked and well-drained hamburger. Add a little water if needed for everything to be well combined. Serve on corn or whole wheat tortillas.